On 18 September 2017, Algeria celebrated the 20th anniversary of the Mine Ban Treaty by destroying its last antipersonnel landmines. The International Campaign to Ban Landmines congratulates Algeria for fulfilling treaty obligation. Algeria had reported retaining 5,970 antipersonnel landmines for training purposes, permitted under Article 3 of the Mine Ban Treaty. After completing landmine clearance and becoming a mine-free country in 2016, Algeria decided not to retain any landmines at all. “Following the largest African country destroying its last landmines and becoming mine free, Algeria`s neighbors such as Libya and Morocco and other states not party have to stop making excuses, they should take action to join the Mine Ban Treaty to help achieving a mine-free region.” Said Ayman Sorour, Director of Protection against Armaments and Their Consequences, a member of the International Campaign to Ban Landmines. In November 2005, Algeria completed the destruction of its stockpile of 150,050 antipersonnel mines. The country has never produced or exported antipersonnel mines but did import and use them in the past. Over 7,000 Algerians have been killed or injured by mines and explosive remnants of war and under the Article 6.3 of the Mine Ban Treaty, Algeria has an obligation to continue assisting all landmine survivors, affected families and communities. The Landmine Monitor findings show that Algeria needs to take action to develop central data collection mechanisms to improve planning of victim assistance program; formally endorse and implement the victim assistance action plan which was developed in collaboration with NGOs and mine survivors; and ensure that all victims are registered and, therefore, able to receive pensions and other benefits. The destruction of retained mines took place in Hassi Bahbah, in Djelfa Province. The event was witnessed by the President of the Sixteenth Meeting of States Parties to the Mine Ban Treaty, Ambassador Thomas Hajnoczi and members of the International Campaign to Ban Landmines: Ayman Sorour from Protection Egypt and Youcef Rafai and Slimane Maachou from the Association of Solidarity for the Handicapped and Mine Victims of Algeria. Algeria signed the Mine Ban Treaty on 3 December 1997, ratified it on 9 October 2001, and became a State Party on 1 April 2002. 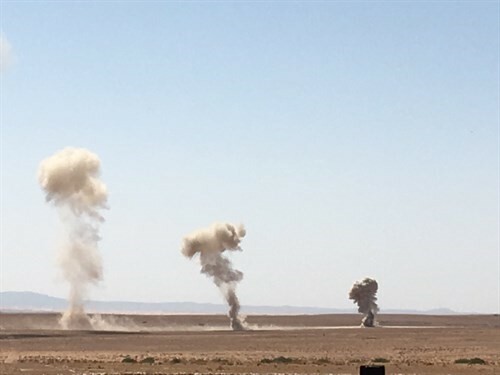 Photo: Destruction of antipersonnel mines, Djelfa Province, Algeria, 18 September 2017. Source: Ayman Sorour/ICBL.